I have a serious penchant for awful movies and by "awful," I mean made-for-TV-movies. The majority of straight-to-TV films are full of plot holes, predicable endings and awkward dialogue but that's what makes them so amazing. It's also nice that I can clean my house while watching one because I can leave the room for time to time and not really miss anything. Well, the DIVA network is a wonderful place to find movies on the weekend and last night was no exception. Although not an original TV movie, I believe it's found an appropriate home. 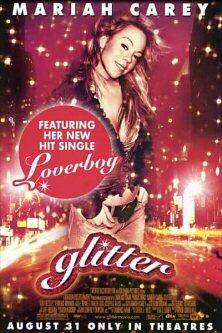 The movie I'm referring to is Glitter, starring the unintentionally hilarious Mariah Carey. 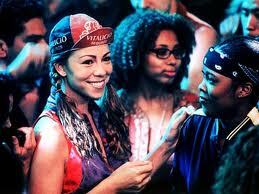 (a) Mariah Carey plays "Billie," an aspiring singer who's also an orphan. Not only is "Billie" like the worst name ever for a character, but being an orphan takes her character's emotional handicaps to the next level. Her mother was a somewhat famous singer who ended up losing her marbles. (b) Billie likes to wear a smear of silver glitter somewhere on her skin EVERY DAY. Some days it's on her shoulder, others on her collarbone or back. It's like playing "Where's Waldo." I keep waiting for it to smudge on something. (c) Billie's two best friends, who she met in the orphanage BTW, are played by Da Brat and the scary cop chick from Third Watch (pre-crazy-lip-job). DA BRAT?! Amazing. (d) Billie's manager likes to wear dress shirts that aren't buttoned to parties, award shows and clubs...oh, and his name is Dice and he wears a necklace with his name on it. He also prefers to say "chu" instead of "you." (e) It's set in the EIGHTIES and, therefore, the outfits are breathtakingly mortifying. I won't give away the end but trust me, it's epic and involves a character played by Terrence Howard. TERRENCE HOWARD! And, of course, Billie sings a power-ballad in front of a packed stadium (which she wrote herself and her label didn't want her to sing, obviously)...in a 40% see-through dress. I NEED to find this movie on DVD because it belongs in my rotation of when-I'm-sick-or-sad movies. It's GLORIOUS! I just love you, friend, but GLITTER? Okay, okay...I'll give it a try. But only because you told me to. Ha, I remember when this came out!! It is pretty ridiculous. And I'm surprised that Mariah agreed to be in front of a movie camera, considering that apparently she only likes to be photographed on one side of her face. @ Andrea - Hold onto your fedora Andrea because GLITTER will make your brain explode. Oh man, just thinking about it's awful-ness brings a smile to my face. ENJOY! !